Sheree Goins and her family celebrating at their baby shower. Change has come fast for Goins since she stepped away from her 15-year hospitality career with MGM Resorts International. Nine months after her 2014 graduation from the UNLV EMBA program, Goins changed both jobs and industries. When Goins began her EMBA, she was very happy at MGM having held numerous front-desk management roles. “At the time I thought I would be in hospitality forever,” said Goins. With an added sense of self-assurance gained from the early days of her EMBA experience, Goins began further satisfying her quest for new knowledge. “I started seeking out senior MGM executives in departments outside my own to ask why and how business decisions were being made. When I explained that I was pursuing my EMBA, they were more than happy to spend time walking me through the processes and reasoning.” During the EMBA program, Goins was promoted to an MGM corporate-level position as senior learning consultant. With plans for career change yet to be clearly formulated, fate and a fellow EMBA cohort member intervened. Almost nine months after receiving her EMBA, Goins received a call from a fellow alumni about a physician relationship manager position with Valley Health System’s Centennial Hills Hospital Medical Center. “I didn’t have a background in healthcare, but it’s about being ready for an opportunity,” she said. “That preparedness really came out of my experience in the UNLV EMBA program.” Goins accepted the position, relishing her role in an unfamiliar industry. In mid-2018, she was promoted to her current position. Goins loves the variety and challenges of her present position, where she reports directly to the CEO and is responsible for such business and operational aspects as new business development, strategic planning, promotion of hospital services and physician recruitment. But more than anything, Goins values the people at Valley Health System. Something similar attracted her to the UNLV Executive MBA program. “My choice of the UNLV EMBA program was really about being in a classroom with other executives and learning from them,” she said. For Goins, the UNLV EMBA impacted her personal life as much as her professional life. “Early in the program and then again at the end, we were challenged to write a five-year life plan. And, nothing less than brutal honesty was accepted,” she said. 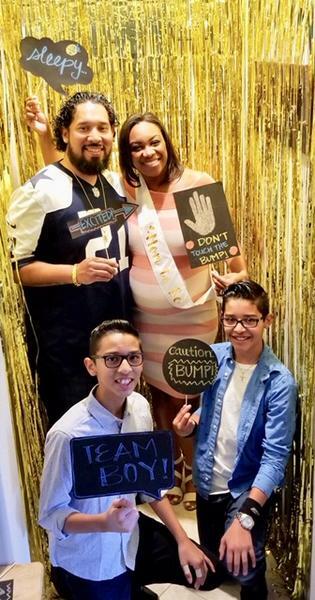 “My plan included marrying my now husband and having a baby.” The couple will welcome their new son or daughter in January 2019.